Cell-based research helps in the evaluation of diagnostic and therapeutic applications of various types of cells in the management of chronic and infectious diseases. The availability of government support for promoting and supporting cell-based research activities, such as single-cell analysis and stem cell research, is driving research into the application and end-user industries for cell analysis. 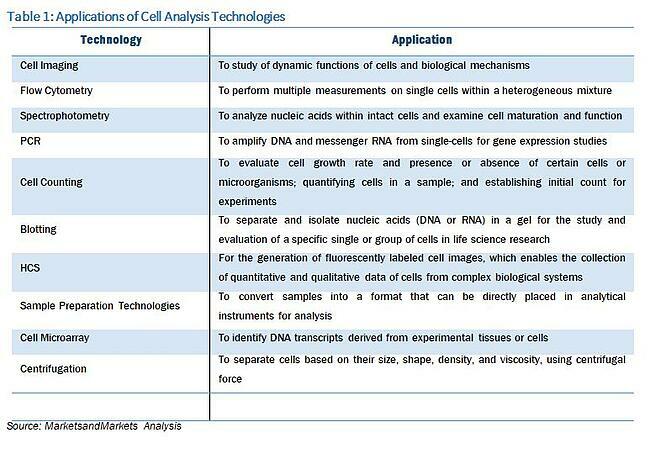 Single-cell analysis is an emerging application which may play a pivotal role in the life sciences arena. It refers to the study of cell-to-cell variations within an organ, tissue, and cell culture. 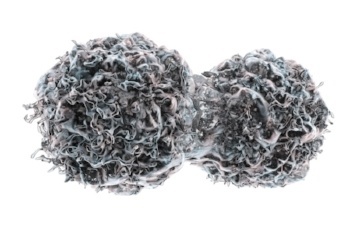 This process allows the in-depth study of stem cell differentiation and cancer. Isolation of a single-cell is done by using a Fluorescence Activated Cell Sorter (FACS), microaspiration methods, or laser capture microdissection. The qPCR technique is used to study gene expression in single-cell analysis. Cell analysis is carried out through various technologies, such as cell imaging, flow cytometry, spectrophotometry, polymerase chain reaction (PCR), cell counting, blotting, high-content screening (HCS), sample preparation, cell microarrays, and centrifugation. The cell analysis market is estimated to grow at a CAGR of 6.56% from 2015 to 2020, according to a report by MarketsandMarkets. The availability of funding for cell-based research and rising incidence of chronic and infectious diseases are some of the major factors driving market growth. However, the high installation and implementation cost of cell analysis systems is expected to restrain the growth of this market. In November 2016, Merck KGaA launched the CellASIC ONIX2 Microfluidic System for advanced live cell imaging. This microfluidic system converts laboratory microscopes into tools for live cell imaging, which helps in the study of cell interactions and mechanisms. In May 2016, Merck Millipore expanded its Guava flow cytometer line with the addition of a high-power modulated green laser. The addition of a 532-nm laser has expanded the detection capabilities of the Guava easyCyte instrument line to enable the simultaneous detection of multiple fluorescent proteins. In April 2016, BioTek Instruments, Inc. launched the Gen5 3.0 Data Analysis Software for imaging and microplate detection instruments. This software helps in advanced image analysis, including cell segmentation and object-level measurements, which are important in several cell-based imaging applications. Geographically, North America accounts for the largest share of the market, followed by Europe. The large share of North America is attributed to the growing number of biotechnology and pharmaceutical companies, increasing prevalence of chronic and infectious diseases, and higher investments in cell-based research in the region. The Asian market is expected to witness the highest growth during the forecast period, mainly due to the increasing focus of players on emerging Asian markets, government support, high prevalence of diseases, and constant growth in healthcare expenditure. 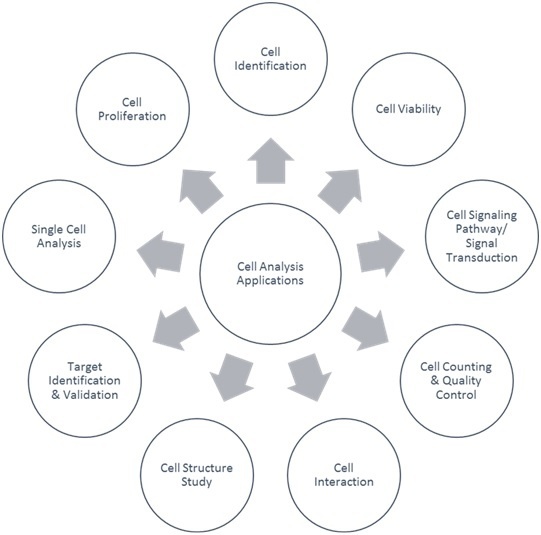 Asian countries, particularly China and India, offer significant opportunities for cell analysis instruments and reagent manufacturers due to an increase in research and development activities in these countries. In addition, as markets in developed countries are moving towards saturation, Asia will be the favored destination for manufacturers and suppliers. However, North America and Europe are the preferred locations for drug discovery, owing to the presence of established clusters in these regions. As compared to other regions, the cost of drug discovery is higher in North America and Europe; nevertheless, companies compensate these high costs through well-established clusters, with the support of rich infrastructure and talent pool. Though countries in Asia offer low-cost advantages, certain disadvantages in terms of technologies and infrastructure are present in these countries. Thus, the development of infrastructure and adoption of new technologies will support the growth of the Asian market in the coming years. An analysis of the market developments between 2013 and 2015 revealed that product launches were the most-widely adopted growth strategy, followed by partnerships, collaborations, contracts, and agreements that served to strengthen the market position of major players and further consolidate the market. 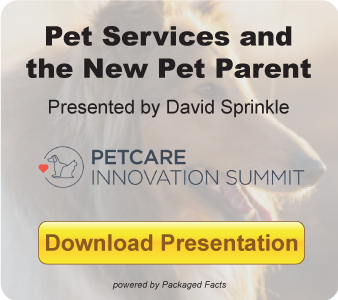 These reports are designed to help both established firms and new entrants gauge the pulse of the market and understand the competitive landscape in order to create effective go-to-market strategies. About the Author: Sachin Sinha is a Research Analyst at MarketsandMarkets Research Pvt. Ltd, a global market research and consulting company.